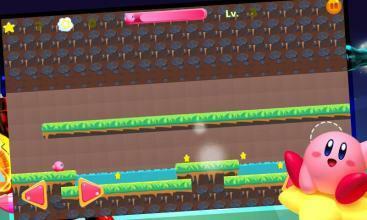 Get the new version of the kirby space run adventure , for all ages and specially kids. This incredible game gives you the pleasure of remembering childhood, travel the universe into an amazing journey and face monsters to rescue the universe. Improve your states record by winning stars and collecting diamonds and bullets. Use it against your enemies to reach the final level in order to face the stars monsters. The superhero kirby is ready to live this wonderful adventure and save the planet kirb from disappearance of stars. Be careful because Meta knight and king dede are looking for you. Rescue the brave kirby space and be the super hero in robot machine bot by winning battles against ally of stars and use your bullets to kill the evil monsters. 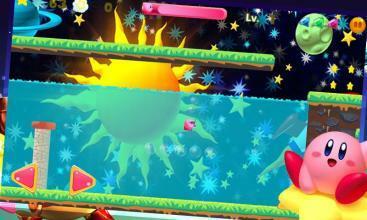 This kirby amazing space run adventure game makes you able to run, jump, surf and discover the stars universe. 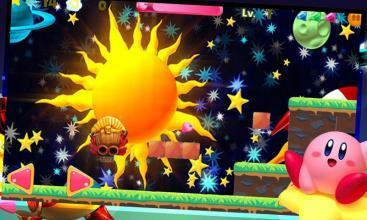 Stunning and colorful graphic design , epic levels with croissant difficulty so all kids and children can adapt with. Help our stars warrior to reach the final hero battle Get the better score and improve your game ranking to get free gifts that helps you to defend yourself and kill easly your enemies. Go far in universe, destroy all monsters and win the golden star in the last space war adventure of all times in amaing kirbi space run. Achieve high score by collecting all special item, the genie will help you to pass the hardest levels by using the magic lamp. don t wait DOWNLOAD now and ------------------------------------------------------- HOW TO PLAY ------------------------------------------------------- 1. Control pad and buttons available to control the prince 2. Collect as much gold coin and do not fall off the pit 3. Reach the end of the map to complete a level ------------------------------------------------------ FEATURES ------------------------------------------------------ 1. Smooth control interface 2. More than 4 worlds you can play and more levels will be added in future. 3. Great graphic, good soundtrack 4. Challenging gameplay and highly addictive 5. Suitable for all ages and even kids!